Invisibly protect building facades with Waterproof wall treatment + strong Anti-Mould Fungicide. One coat of this invisible impregnation wall waterproofer, applied to any masonry substrate, will ensure rainwater and light contaminants are prevented from discolouring and damaging your stone surface for up to 10 years. Furthermore, a strong Anti-Mould Fungicide will prevent mould, mildew or lichens from forming in previously damp areas. Suitable for high value and historic buildings this weather resistant treatment is a must for all building facade, stone cleaning and refurbishment schemes. 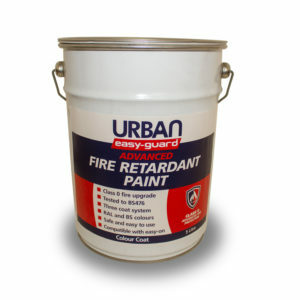 Whether the facade of your building is made from concrete, brick, render, cladding or stone; Urban Hygiene’s Wall Waterproofer + Anti-Mould Fungicide is the best value Waterproof building treatment you are looking for. Engineered for a 10+ year lifespan, applying this invisible impregnation treatment to your building the very next time you clean will return on investment and ensure your building stands out clearly from the crowd. For long term resistance to natural contaminants such as mould, moss, lichens and algae this durable Wall Waterproofer has an added Fungicide Biocide which prevents the growth of all green life. Even on low light, south-facing walls, which often stay damp due to the lack of sunlight, this permanent moss and algae prevention system will totally inhibit growth and keep sandstone, concrete, brick, natural stone and render walls looking clean and the colour they were intended to look. Our inner city building facades are increasingly becoming choked with pollutants from the traffic driving by below. Combustion engine driven; Cars, Vans, Trucks and Busses all spew out CO2 which combines with other contaminants in the air to form smog, which in turn, lands on our buildings and is absorbed by porous substrates such as brick concrete and stone.